Brooke Ramsey is running out of time. She needs to save her father’s reputation before she loses him to illness. That means finding the painting that went missing while in his care. Fast. Which is why she teams up with Victor Gage, owner of Treasure Seekers agency.The charming private detective has more at stake than uncovering a lost masterpiece. He’s investigating his wife’s death, and the artwork holds the answer. As Victor and Brooke draw closer to each other, so does a murderer. Someone wants the past to remain buried and will kill again to keep it hidden. Click here to read the “Romantic Times” review of Lost Legacy. 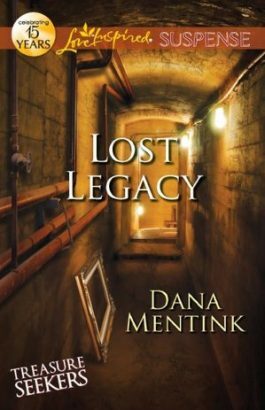 I’e been looking to add new authors to my auto-buy list for Love Inspired Suspense line, and after reading LOST LEGACY I think that Dana Mentink might be it. Brooke Ramsey is shy and vulnerable but determined to find the lost masterpiece that meant so much to her ailing father. The painting had disappeared together with the person it had been sent to for the purpose of authentication. Feeling that somebody is following her and knowing she needs help, Brooke turns to Treasure Seekers Agency. Victor Gage, once a doctor turned a treasure hunter, is the owner of the Treasure Seekers Agency. After his wife’s death in a hit-and-run accident, his heart has turned to stone. Very selective in what cases he takes on, he turns Brooke down at first. That changes when Brooke is attacked and a woman who’s followed her is shot. He also feels that the lost painting might help him to find the person responsible for his wife’s death. Will Brooke’s faith bring down the walls Victor constructed around himself? Will they find the hidden treasure in crumbling tunnels? Will they discover who is to blame for the robbery and shooting?